Four additional O3b satellites roared into space on April 4, seamlessly scaling SES's MEO constellation. Launched by Arianespace, the constellation has positively impacted millions of people with low-latency, high-performance data connectivity services, and will mark transition into its next-gen MEO system. The successful launch of the four O3b medium earth orbit (MEO) marked a significant milestone in SES’s O3b MEO journey, bringing the number of O3b satellites launched to 20. The addition to the O3b constellation is much anticipated by SES’s customers around the world which include mobile network operators, cruise operators, internet service providers, and governments, among others. The seamless scalability of the constellation means that the additional satellites will enhance coverage across the globe and enable SES Networks to provide greater service availability and reliability to cater to the increasing demand for networked applications in the government, telecom, cloud, maritime and energy markets. The satellites were built by Thales Alenia Space. 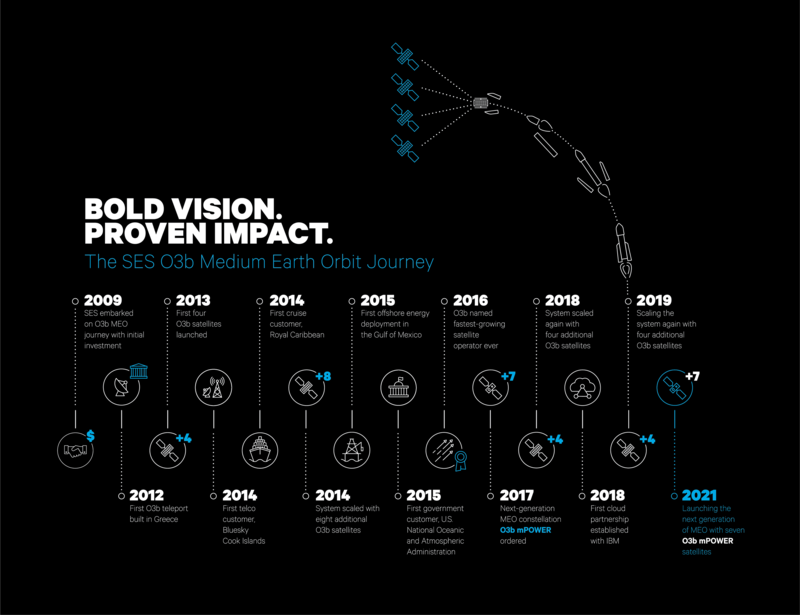 As the only operationally- and commercially-proven non-geostationary satellite orbit (NGSO) broadband constellation, the constellation of 16 O3b MEO satellites system has been successful since its first launch in 2013 and is delivering today: everything from 3G /4G LTE connectivity in rural areas, connecting customers to the IBM Cloud, delivering premium broadband services for cruises operators such as Carnival and MSC, enabling peacekeeping efforts, complementing Project Loon’s connectivity, among others. The O3b constellation delivers fibre-equivalent performance and has massive geographic reach, enabling the delivery of high-performance data networks and solutions – including cloud services and applications – across the globe. Positioned at approximately 8,000km away from the earth, the O3b MEO satellites are approximately ¼ of the distance from the earth than traditional geostationary (GEO) satellites. The Ka-band constellation will enable SES to continue the drive towards digital equality and generate social and economic development by delivering high performance communications anywhere, even in the most remote areas. By scaling the O3b MEO constellation efficiently, SES Networks will be able to offer more capacity, enhanced coverage, increased efficiencies and greater flexibility. Together with MediaHaus and WildVision, we’re bringing snow volleyball to viewers around the world. © 2019 SES S.A. All rights reserved.